We have based this piece on the experience of people living in the small town of Maseno on the shores of Lake Victoria. It is an area where malaria is so common that by the age of two nearly every child will have been infected. The consequences of recurrent infection throughout life are profound as can be seen in the health of the population many of whom have resulting chronic anaemia. In children under the age of five, malaria is the commonest cause of death in this region of Kenya. The adult wards are full of patients with HIV related illness but the children’s wards are full of babies and infants being treated for malaria. 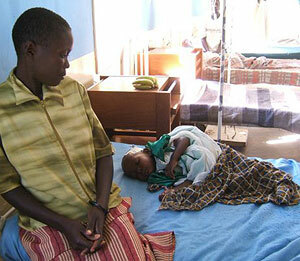 The child in Veil of Tears is modeled on a baby in the children’s ward of Maseno hospital. Her mother and father talked not only of the fear they experienced when their child was ill, but also of the economic consequences of bringing her to hospital. This included a day’s pay for the bus fare, the equivalent of one month’s pay for the hospital treatment, and the expense of missing work. The survival rate for children with severe cerebral malaria has a direct correlation with the likelihood that they are treated in hospital and this depends on the distance the family live from the nearest hospital, and whether they can afford to go. 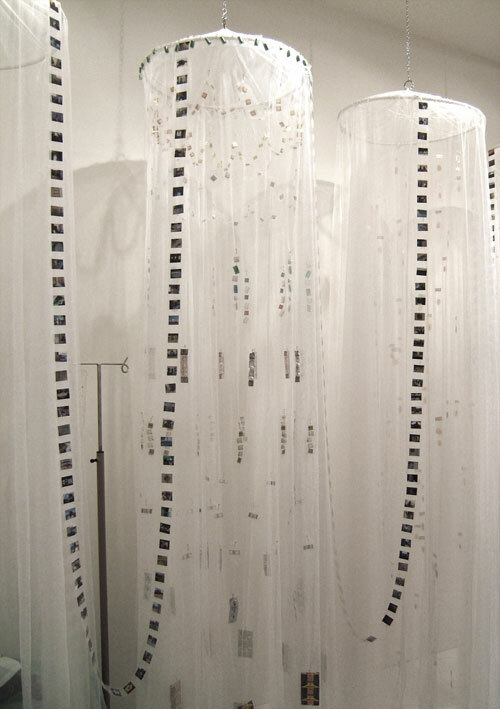 The Veil of Tears installation considers the burden of malaria in the first five years of the life of a child living in Maseno. It is based on academic research carried out in the local region and on our own observations and interviews. The first net demonstrates the number of mosquito bites infected with Plasmodium Falciparum sporozites that a five-year-old child will have had. This is known as the Entomological Inoculation Rate (EIR) and in the Maseno region the daily EIR average is 0.6 infective bites per person. Sleeping nets impregnanted with permethrin reduces the EIR considerably but often people could not afford nets, or when they had them did not always use them. Research in the region also suggests that one in thirteen of these sporozite inoculations or bites is likely to to result in infection. The second net contains eighty-four finger prick blood films, which represent the number of times this child might be infected with malaria before she is five years old. Most cases of malaria are treated at home and people buy antimalarial drugs in the nearest pharmacy if there is one, or at the local shop. There is increasing resistance to the drugs used to treat malaria. The more money you have the more effective drug you can afford. 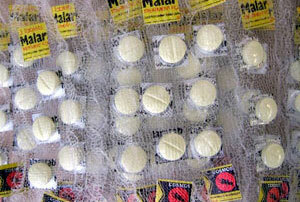 Most people take a course of three antimalarial tablets for each episode of malaria. Many take a course every time they get a temperature whatever the cause. 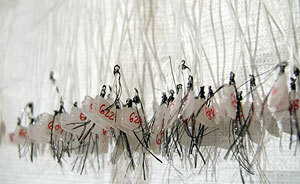 The drugs in the third net increase in price and in efficacy as they rise up the fabric. The final net partially covers a sick child receiving the drug chloroquine into a vein in her scalp. Her mother sat with her day and night. She eventually made a complete recovery but is very likely to be ill with malaria again before she reaches five years old.